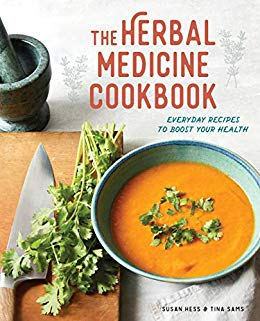 The Herbal Medicine Cookbook is the definitive kitchen reference to transform everyday meals into natural remedies.Your kitchen is the heart of a holistic life. The Herbal Medicine Cookbook infuses everyday cooking with the healing power of everyday herbs to nourish your body with healthy, homemade meals.From Elderberry Hot Toddy Elixir to Sunday Roast with Chimichurri Sauce, this cookbook offers step-by-step guidance to transition from traditional to medicinal cooking. With 75 restorative recipes that use only commonly found herbs—plus over 30 herb profiles on taste and usage—The Herbal Medicine Cookbook is your kitchen reference to revitalize your life through herbal healing.The Herbal Medicine Cookbook includes:Medicinal cooking 101 that covers diverse tastes and everything you’ll need to start cooking.75 recipes for breakfast, soups and salads, main dishes, snacks and sides, condiments, beverages, and sweet treats.30+ herb profiles for quick reference on taste, herbal complements, preparation, and healing properties.Food is medicine. Make cooking a cure with health restoring herbal recipes from The Herbal Medicine Cookbook.